With so many world-famous attractions and breathtaking views, Europe continues to be a favourite road trip destination. You can easily drive from one country to another in just a few hours. However, there are restrictions when it comes to taking a rental car abroad. The policies for each car rental company are unique, but if they do allow their vehicles to be driven outside the United Kingdom, you will need prior authorisation to do so. Whether or not you will be able to take your rental car abroad depends on which countries you are planning to visit, as well as the type of vehicle you have hired. In some cases you will be charged an additional fee. To help you arrange the perfect car hire for your next European road trip, compare rental cars at VroomVroomVroom or contact us. Once you have booked a car hire, check out these important driving tips in Europe. More than 170 cities and towns across 10 countries around Europe, including Germany, France and Italy, have areas where the highest polluting vehicles are regulated and monitored. You may end up paying a fee or registering your vehicle if you enter a low emission zone. For more information, visit Urban Access Regulations in Europe. Always make sure you have breakdown and insurance cover when driving in a foreign country. This is usually included at extra cost when you hire a car however if you plan to take your own vehicle you will need to let your insurance company know. Read our car hire insurance guide to know what type of protection product to purchase. It is a good idea to research the countries you will be travelling to and determine the methods of collecting tolls. 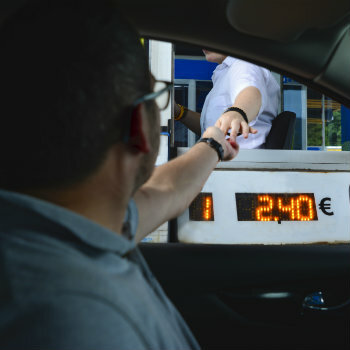 In some countries, including France, cash is still accepted at toll gates. In other regions you may be expected to display a sticker on the car so you will not be charged for driving on certain roads. For a list of toll highways and rates, click here. It is illegal in most European countries to use a mobile phone while driving. 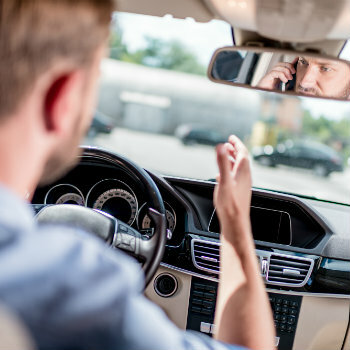 Hands-free mobile phones are allowed in most cases, but it is best not to use your phone to avoid paying a fee. In France, the use of headphones or earphones are banned to avoid motorists from becoming distracted from their environment. Some of the most expensive penalties are implemented in Denmark, Netherlands and Spain. Unlike the United States which has a blood alcohol content limit of 0.08%, the blood alcohol content limit is significantly low in Europe. There are even countries that have zero tolerance for drunk drivers, including Czech Republic, Hungary and Slovakia – which means that you are not allowed to have any trace of alcohol in your blood. The European Commission shared a list of countries and their standard BAC limit. If you are used to driving a right-hand drive vehicle, then it may take a bit of adjustment driving in most European countries. All countries in Europe except the United Kingdom, Malta and Ireland drive on the right side of the road. Roundabouts can be a bit challenging as well since vehicles move in a counterclockwise direction. Avoid staying in the centre lane of a three-lane highway and instead stay in the right and pass a car when needed. Check your rear-view mirror for speeding cars. It is illegal to to turn right when the traffic light is red in most European countries, including France and Russia. British drivers won't have a hard time adjusting with this rule since the same applies in the UK. However, there are some areas where a sign or signal indicates that you can turn right even on a red light. Most European countries have a general speed limit of 120 or 130 km/h for motorways, 80 or 90 km/h for rural roads and 50 km/h for urban roads. The general speed for residential areas is 30 km/h. To avoid getting a speed ticket and paying exorbitant fees, like in the case of Finland which calculates the fine based on the person's monthly salary, it is best to check the speed limit of the place you are planning to visit. Click here to see the speed limits throughout Europe. It is important to know what the road signs mean so you can get to your destination safely and avoid getting in trouble with the law. Most European countries have standard signages, but there are some with minor difference in the design like the colour and font. 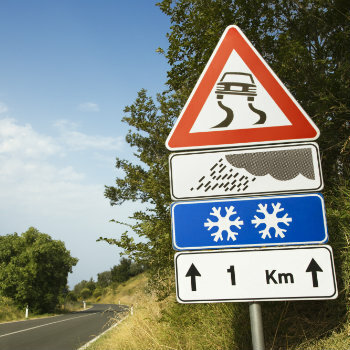 Take time to check out the road signs in Europe to guide you during your trip. These are just some of the basic driving tips in Europe and we hope that these information will help you have a pleasant and hassle-free road trip.